Teaching with TLC: The first Teaching Blog Expo! 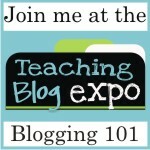 The first Teaching Blog Expo! In one day, in the comfort of your own home, you can learn from 7 of the teaching blog community’s best bloggers and find out exactly what you want to know! These sessions cover everything bloggers and teachers want to learn and there are HUGE goodie bags for registering for the live event!